Licensing deal – availability in iTunes, Spotify and much more! Well, an update was long overdue, so here we go. 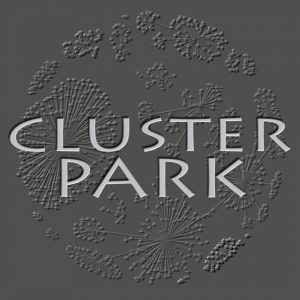 FOR GREATER GOOD is proud to have an agreement with CLUSTER PARK. What does that mean for you, our dear fans? Well, Cluster-Park, founded in 2017, is specialised in global music distribution (digital, vinyl, CD), licensing, publishing and synchronisation. Additionally Cluster-Park offers services in digital marketing, media promotion, legal advice, catalogue management and artist & repertoire support. In practice, this means that in the first place we will be available on a lot of digital platforms. There was the Bandcamp page of course, but that’s just the tip of the iceberg. Now, the deal with Cluster Park will see us pop up on iTunes, Deezer, Spotify and many more. All our albums (5 up till now) are available for listening, buying and downloading. Click on the source of your choice in this post and bam, you are there! If more are added, we will keep you all updated. If that’s not enough already, we now also have a dedicated YouTube channel. Here you can listen to all the albums and songs as well, and give them a big thumbs up. It is also very convenient to spread the word around on Facebook and the like. As a fan, you can really help us by listening to our music, liking, sharing and reviewing. It won’t take much of your time, but it would be a big help for us. Thanks in advance and enjoy! There’s life outside For Greater Good of course. Izzy and samdevos are busy with some other projects as well, so maybe it’s time to highlight some of them, too. 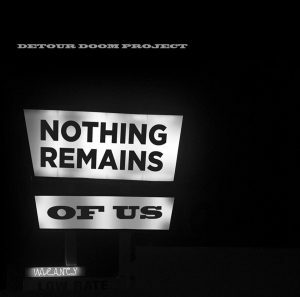 Detour Doom Project is a darkjazz/ambient project where Izzy plays trumpets and flugelhorn on their new CD “Nothing Remains Of Us”, and it got a very nice review in Belgium’s leading underground magazine Dark Entries. Another project Izzy is involved with trumpet-wise is The Sarto Klyn V, Ian Ferguson’s pet project, which is a bit more smooth jazz than Detour Doom Project. It’s been rather quiet in camp FGG that last couple of… well… years actually. Real life kicking in does that sometimes. But now we have something new to show you. First off, a never released song, only played live a couple of times. “And Thus… Unfolds” is an abstract audio-visual sculpture depicting urban life, decay, industry, concrete and polymer, wire and wireless, alienation through social media and the hectic society of today. Already adorned live with an excellent art-video by VV303’s Steve Deconinck, this song was also picked up by another artist who made his own visual interpretation of the song. Alex Amerantropoides , explorer of the mind and artistic jack-of-all-trades, made some stunning art videos before… and this one is no different! He had a very interesting personal view, but still with the FGG vibe clearly present. Check out his other stuff as well. Enjoy the new song and video! For Greater Good features with a new track “Northern Lights” on the “Hera: Protector of Teddybears since 2012” compilation cd! This cd is out on Choeur Noir, a very nice Belgian label led by Leslie Philippot. “Hera” is a birthday compilation, celebrating Leslies daughter Hera’s first birthday, with tracks by For Greater Good, Dead Man’s Hill, Ataraxia, Cawatana, Larrnakh, David E. Williams, Harvest Rain, Dark Poem, Misantronics, H.E.R.R., Kinderen Van Moeder Aarde, Engelsstaub and Darkwood. First 50 customers get 2 free buttons with their order! For more info, prices and availability, visit the Choeur Noir website. What a nice show yesterday, and what a cool bunch of colleagues, crowd and crew! Up to the next one! 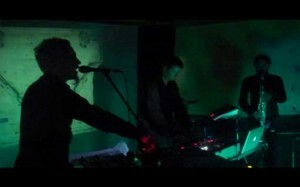 We have been rehearsing for the next concert on Sunday 25th 2013 at the Open Music Synergy Meeting in café Carpe Diem, Hasselt. Rehearsal sounded great and we’re looking forward to be on stage again. We hope to see you all there! Join us for some talks about music with the people that make it, meet some new people, enjoy some bands and/or dj-sets and have a drink! 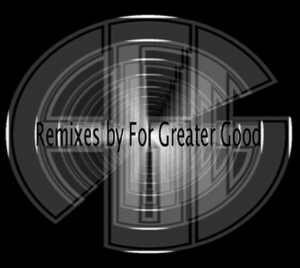 Remixes By For Greater Good now available as FREE download! After the work and effort of the Remixed and Reworked series, we were looking at our Bandcamp page and discovered an album that went a bit in a shady corner… so we thought it was time to revamp it: the Remixes by For Greater Good! Unlike the R&R, where other bands covered our music, in this album we did the opposite, FGG remixed songs by other bands. Recently, we sent some mails around, and everyone agreed to put these remixes as free downloads! You can download every track for free, or download the whole album in one go! You can find remixes here by these nice bands: WUMPSCUT, GENERIC, NO MORE, PSY’AVIAH, LIQUID G., SAY HELLO TO MY KIDS and DARK CONTROL OPERATION! As this is a nice gesture by the bands we remixed, please show your appreciation by visiting their websites, listen to their music and buy what you like! For Greater Good Remixed & Reworked – OUT NOW! Finally, I hear you say! Yes, batch 9, the final batch, it’s really here! A breath-taking 28 remixes are now uploaded and downloadable for a small fee, yes you read that correct, we uploaded not 3 but 4 new remixes for your enjoyment! – And, to close the circle: Dogged, made into a lovely minimalist electro remake by Dreamwash, the alter ego of FGG’s Sam Devos! They were added to the album Remixed and Reworked, listen and download all 28 songs NOW! The songs are 0,79 euro a piece, and a measly 5 euro for the whole Remixed and Reworked project! You read that right, 5 euro for 28 songs! So support ALL artists involved and discover some bands. Iz and Samdevos, For Greater Good. For Greater Good Remixed & Reworked – First batch of the New Year! Yeap, it took a couple of weeks, but after the holidays, here we are again with a brand new batch – batch 8 already! – Distress has been remixed quite some times already, but this rework by Dan Fox mixes noise, electro, punk and a good dose of symphonic elements into one very interesting blend! They were added to the album Remixed and Reworked, listen to all 24! We are nearing the end of this extensive batch, remember you will have the chance to buy all remixes very soon for a modest price! Villa Synergy is an independent streaming radioshow on Villa Bota. They asked us to come up with something special for their “End of the world” all-nighter. And so we did, we mixed an hour long set of Remixes and Reworks by various artists of songs of our first album. Enjoy the one hour FGG – Remixed & Reworked DJ-set for Villa Nocturnal. All rights reserved by For Greater Good | © 2004-2011 | Powered by pure damn awesomeness. | Tuned up by WaveLab.